1. 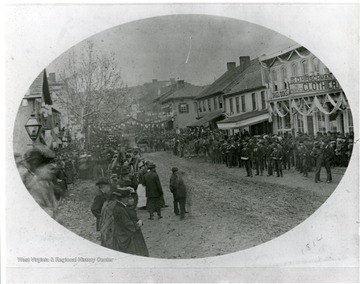 Call to Arms: Volunteers for Union Army Assemble on High Street, Morgantown, W. Va. 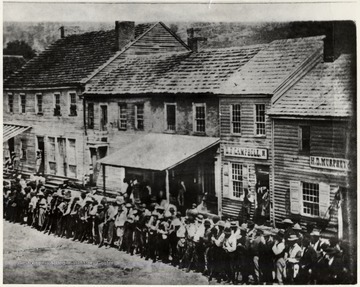 Call to Arms: Volunteers for Union Army Assemble on High Street, Morgantown, W. Va.
Men line up to volunteer across from the Court House, at Carrico Corner - High and Walnut Street, Morgantown, W. Va.
2. 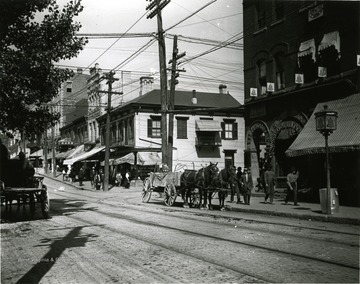 Wagon Traffic on High Street, Morgantown, W. Va. 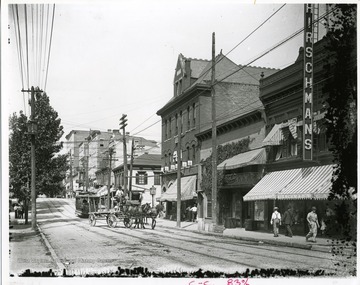 Wagon Traffic on High Street, Morgantown, W. Va.
3. 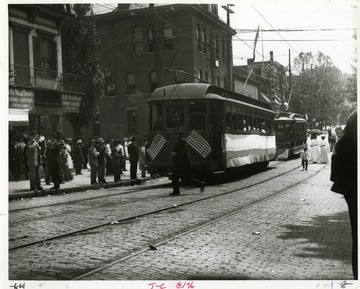 Streetcars on High Street, Morgantown, W. Va.
Streetcars on High Street, Morgantown, W. Va.
Townspeople are boarding street cars on High Street in Morgantown, West Virginia. 4. Parade at High and Walnut Streets, Morgantown, W. Va.
5. Rush on Second National Bank During the Depression, Morgantown, W. Va. Rush on Second National Bank During the Depression, Morgantown, W. Va.
Large crowd of people stands in the street in front of the Second National Bank in Morgantown. 6. 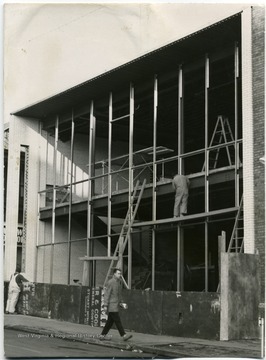 Construction of the Farmer's and Merchants Bank on High Street in Morgantown, W. Va.
Construction of the Farmer's and Merchants Bank on High Street in Morgantown, W. Va.
Two men work on the building. 7. Odd Fellow's Building, Morgantown, W. Va.
8. Strand Theatre Fire, Morgantown, W. Va.
Strand Theatre Fire, Morgantown, W. Va.
Debris left from the Strand Theatre fire on High Street in Morgantown, W. Va. Crowd gathered to see the sight. 9. 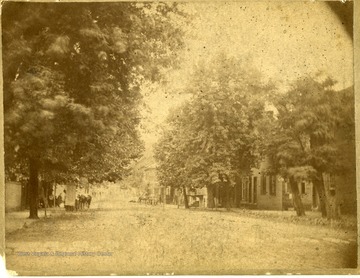 Scene on High Street, Morgantown, W. Va. 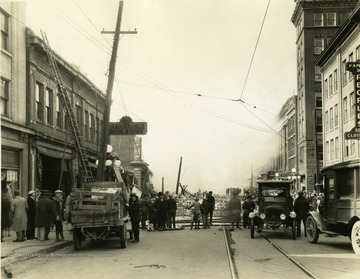 Scene on High Street, Morgantown, W. Va.
10. High Street, Morgantown, W. Va.
11. 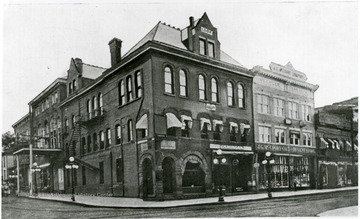 Call to Arms: Volunteers for Union Army Assemble at Carrico Corner on High and Walnut Streets, Morgantown, W. Va. 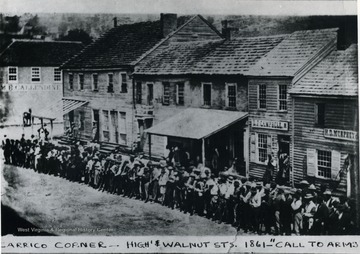 Call to Arms: Volunteers for Union Army Assemble at Carrico Corner on High and Walnut Streets, Morgantown, W. Va. 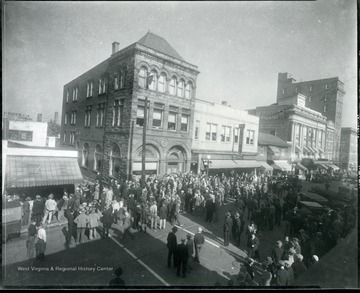 Volunteers assemble for Union service at the corner of High and Walnut Street, opposite of the Court House in Morgantown, West Virginia. 12. Winter Scene on High Street, Morgantown, W. Va.
Winter Scene on High Street, Morgantown, W. Va.
'South view of High Street near the Post Office and Montgomery Ward Store.' 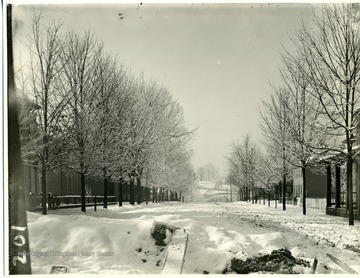 A view of High Street on a snowy winter day before 1926, because the High Street Bridge wasn't built yet.